The common frog (Rana temporaria) is the most widespread of Ireland’s native amphibians, and as such, it is probably the most familiar. Found in all counties, this species inhabits a wide array of habitats, both terrestrial and aquatic, including some urban habitats. Adult frogs attain lengths of 6-8cm, with females typically being larger than males. The common frog’s cryptic colouration serves as excellent camouflage. While this species displays significant variations in colouration, there are certain characteristics which can help in identifying this species. This species frequently displays a dark band of skin along the eyes and back towards the tympanum (ears) though this feature can be diminished or absent in some individuals. A more persistent feature is the dark stripes across the animals limbs. These frogs have a significant appetite and will readily feed on almost any prey item small enough to be swallowed, however the bulk of their diet is comprised of gastropods (such as slugs), dipterans (flies) and annelids (earthworms). The breeding season typically begins in early spring, as temperatures start to rise. During the mating season, frogs will aggregate at water bodies. These water bodies may be permanent, such as lakes, ponds and bogland, or temporary, such as drainage ditches and puddles. Males croak to attract females, a sound which can be heard by females up to 50m away. During mating, a male jumps on a female a grips her from behind. Holding on to the female is difficult due to her size, so males have a special pad (known as a nuptial pad) on a finger of each forelimb to help them grip their mate. Each female can lay up to 4,000 eggs in a spawn clump. The eggs are initially quite small and dense, appearing to sink as they pass from the female, but as they absorb water they grow larger and float to the surface of the water body. The jelly surrounding each egg acts as an insulator, keeping them up to 10°C warmer than the surrounding water. The fact that frogs are communal spawners means that large numbers of eggs from different individuals can clump together, gaining further insulation benefits. After 3-4 weeks, the tadpoles emerge from the egg. At first, they feed on the remnants of their egg mass, before moving on to algae, plant matter and scavenged protein from dead animals in the water body. It takes about 10 weeks for tadpoles to undergo metamorphosis, the process of “turning into” a frog. During this transition, the tadpole undergoes a number of key changes. The small gills that the tadpoles use to breathe slowly disappear as their air-breathing lungs develop. After 10 weeks, the legs and lungs will have developed sufficiently to allow the frogs to emerge on to land and embrace a semi-aquatic lifestyle. These newly emerged froglets are known as “metamorphs”, and will retain a small tail for a short time before it is completely absorbed into the body. It will be 2-3 years before these young frogs reach breeding age, a feat they will repeat every year for the rest of their lives. Most tadpoles will never reach this stage, however only 1 in 10,000 needs to reach maturity to maintain a population. the lucky few that reach adulthood may live as long as 10-15 years. While the common frog is the most widespread amphibian in Europe, it was long believed that it was actually introduced to Ireland rather than being a natural native. It was thought that the last ice age wiped out any naturally occurring populations of common frogs on the island and that all Irish frogs are descendants of introduced populations. 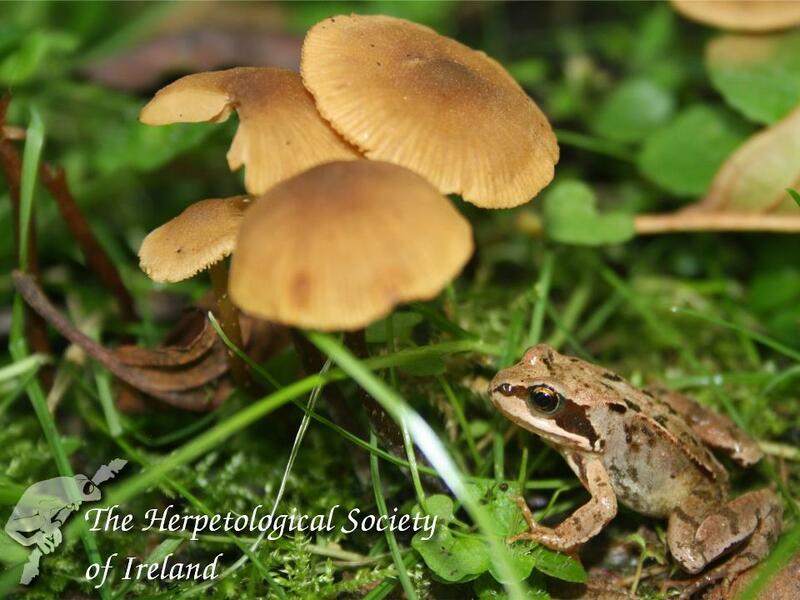 However, recent research has shown that some frogs survived the last glaciation in an ice-free refuge in the South West of the island, and as such, Ireland’s frogs are descendants of both native and introduced populations.